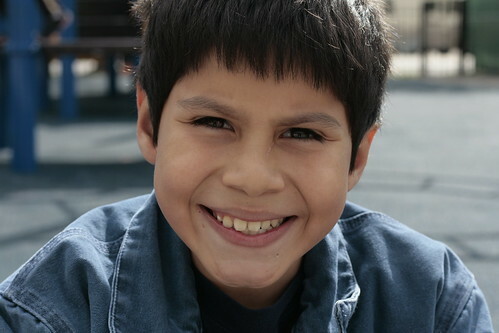 Raul is a chatty fifth-grader who has attended Whittier since kindergarten. "I didn't do the pre-K stuff. I don't think my mom knew about it. But it was OK, lots of kids started in kindergarten with me so I didn't feel lonely or left out." Raul and I began talking about the fight that his mother and the other parents were hoping to win so his school could have a library. "I think about having a library and then I think about all the poor people who don't even get to go to school and then I'm glad I get to go to school, but then I think about all the people who have libraries and we don't and then I remember that we're fighting for a library, for me and all the other kids here who, like really, really, need a library." Raul likes to read, and prefers to read about "real things and especially real people" instead of made-up stuff. "If we had a library I could get more biographies to read. We only have a couple in my classroom and I have a few books at home, but it's boring to read the same thing. Reading is fun and since there aren't too many books at my house, I don't get to read as much as I want to. I bet if we had a library I would even be better about doing my homework cause I would have someplace I could focus." At this point Raul said I could take his picture, but he was eating a few lemonheads and wanted to make sure you couldn't tell he had them in his mouth when he smiled. I took his picture and he nodded and said he thought he looked pretty good. "Man am I glad my mom made me brush my teeth today. I'd be embarrassed to smile if I didn't." I then asked him what the most recent biography he read was. "Oh, I've read this one before, but it is about Benjamin Franklin. He was smart and invented things and he was funny all the time. He was the guy who realized that electricity was made out of lightning. I want to read more books about him." When I'd first arrived at Whittier, I was waiting for the mothers to finish a meeting about how to handle the stress of the situation. They were talking with health care professionals and creating plans of action for the fight they still had ahead of them. 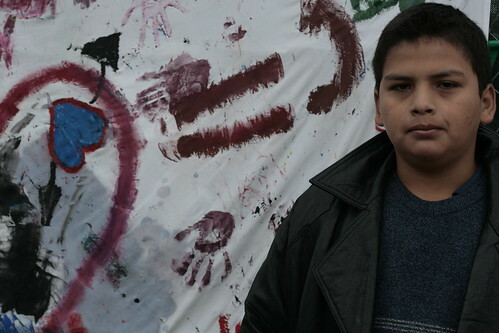 While I was wandering around the playground, photographing the various signs that the volunteers and activists had created, Valentin came up and asked me if he could take some pictures with my camera. I agreed and he immediately began fiddling with all the dials and buttons on my DSLR. "It's better to take pictures of signs with people in them. It's more interesting." Once he realized my camera didn't have a zoom, he gave him his best "tsk, tsk" and handed back my camera. The meeting of the parents ended and I found someone who could help me find Valentin's mother, Angelica, to explain that I was hoping to talk with her son about his interest in the library. Several people excitedly asked me information about who I was and seemed wary, but glad that I was giving a voice to their children. One mother, who refused to give me her name, had a translator tell me, "I'm glad you want to talk to our kids. We're doing this for them, not for us. We want them to have what we didn't, to have what they deserve. They should be able to say what they think. They're kids, but they're just as involved as we are." Valentin's mother gave me permission to talk with her seventh-grade son about his thoughts related to the library. He explained how the school housed kids from pre-kindergarten through 8th grade. "The kids here aren't too good at learning to solve problems or talking better. So many kids just say bad words all the time cause they don't know other words to say. But not me, I like to read. I am pretty good at reading in English and in Spanish." I asked him how many books he had available to read and he shrugged, "It's hard to know. It's hard to know how many books we have to read. Cause some classes have new books cause the teachers bringed them, and other classes just have lots of old books with the covers ripped off and pages are torn. But in a library you don't see books like that, just the good books." He said that he liked to read in Spanish and English and he didn't feel like he was better at reading in one language over the other. "Not many people can read books in two languages, but I can. I just read this book called Cajas de Cartón. It's about a dad who loses his job because his wife was going to have a baby, but there were problems and the family had to pray for a week for it to be OK. It was a milagro (miracle) and the baby was OK and the dad got his job back and it all ended OK, but it was good to read. Like I was reading about real people. I like to read stories about people, they're the most interesting." Carina was eating a sandwich and watching me talk with Valentin and Raul. She was joking with Raul and teasing him as he told me his opinions. I asked her if I could talk with her mother for permission, and she said that her father Paulino had already said it was OK. I looked at him questioningly, and he waved at me and smiled at her. I didn't hear him say anything to anyone while I was there, but he sat and watched the kids playing on the playground. Every time he looked at his daughter Carina, his stern stare softened and just a hint of a smile appeared at the corners of his mouth. As I spoke with her, and as she made me laugh, I could see him nodding and while he never fully smiled, it was obvious that he was proud of his daughter and glad she was talking with me. 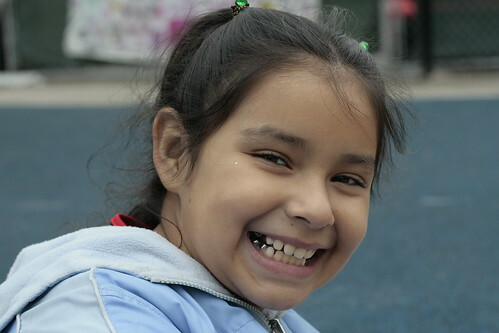 Carina is in fourth grade and has attended Whittier almost her whole life. "I started in pre-kindergarten, which isn't really school, but it seemed like real school when I was little. Even when I couldn't read, I would look at books and pretend I knew what they were about. Now I can read in English and in Spanish and a lot of times my dad has to tell me to stop reading so I can do my homework. I only really like to do my Reading homework, the rest isn't as fun. But I listen to my dad and know once I did my other homework I could read some more books. Sometimes I get so excited by a chapter book, that I start reading it and don't stop until I'm done with the whole book." Carina and Raul pointed out the cameras that were on the school and told me how they put up the cameras after "almost 20" computers were stolen. "I just don't understand why someone would steal a computer?" Carina said. "We don't have enough computers so every time they steal it, they hurt us. It's not very fair. We have to double-up on computers anyway. No one gets their own computer. Not at my school." I asked if she used the computer when she went to a Chicago Public Library. "No, not really. I'm too busy looking at the books. But last school year they closed the library that was near my house so I didn't get to go to it anymore. And it was hard just going there and it isn't too far away. But with my dad having to sleep or work and my brother has to work and, well, time to go to the library doesn't happen so often. And now that we don't even have that library anymore, I don't get to go to the library much ever. It is so far away. So far away that I don't even know where it is. But when I do get to go, I take all the books I can. And since we've had people giving us books here, I've already read two chapter books and I didn't even have to take them home, I just read them here. I already got to read Making Waves and Accidentally Fabulous. I liked those books and hope we get more of them." After Carina went off to finish her lunch, I wandered the playground looking for more kids who were willing to talk to me. Several girls were interested in what I was doing but just became very shy and nervous when I asked if I could talk to them. There were a few kids who were very interested in talking to me, but once I told them I was talking to kids from Whittier, they explained that they didn't go to that school, they just played on the playground equipment. One suspicious father asked me which kid was mine and when I explained that I was talking to the kids of Whittier about why they wanted a library, he became talkative even though he didn't want to give me his name. He said that he went to school at Whittier during the '70s and he knew they used to have a library, so he didn't understand why they didn't just use that instead of trying to build a new one. I explained that I'd discovered that they'd had a library but ended up turning the library into more classroom space in the '80s because the school became over-crowded. He expressed sympathy for the kids and shook his head. His daughter and the other children from other schools I spoke with agreed that it wasn't fair and agreed that they all had libraries at their school. I wandered over to a quiet boy who was sitting by himself eating a bagel with cream cheese. Since he was alone and watching me, I decided to walk over and see if I could ask him if I could speak with him and take his picture. He told me he was camera shy so he didn't want me to take pictures. I asked if we could get his mother's permission for me to talk to him. "I already talked to my mom about it and she said it was OK. But I'm only allowed to talk about the library. But I could tell you about my puppy, too. He's really big even if he is a puppy. He's a lab and sometimes he smells bad." I laughed and asked him if he liked other animals. "I almost like all the animals. No snakes, nope. And not so many bugs, but I don't think they're really animals since they aren't mammals." I asked him if he liked to read about animals and he said they were his favorite kind. "Last year we had a book in my class about mammals and it was my favorite and I think I looked at it every day, and before I went home for summer, my teacher let me keep it. It is my favorite book." I asked where he got books to read since his school didn't have a library. "We have only a few books in my class. Some classes don't have any books, and some classes got books that are so old and tore up that you can't almost read them. But I almost don't read at home since we're not supposed to take books from the classroom to home. But when I do get a book to read I like to read it to my mom. She tries to get me to teach her English. She wants to know everything I learn at school and wants me to teach her, too. I like to teach my mom, but I like to read by myself, too. Especially an animal book with lots of good pictures." I asked him what he would do in the library if the city lets them have one, and he said he would like it because it would mean he had someplace to read during the winter. "Sometimes during recess we get to come outside, but I just want to read and if I had a library I could read inside. It's hard to read when you're cold cause you have to take your glove off too much. Yeah, a library would make it so much easier to read." 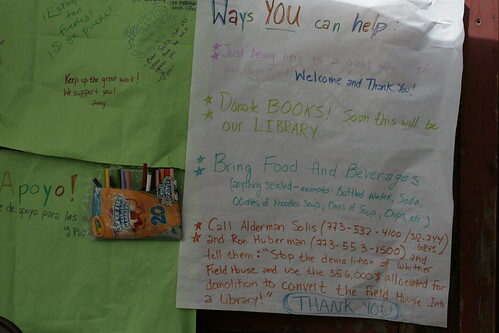 The Chicago Underground Library sent out a call for books to be delivered to the school and within days, hundreds of books showed up, most of which were suitable for the children. The others were set aside for the parents. 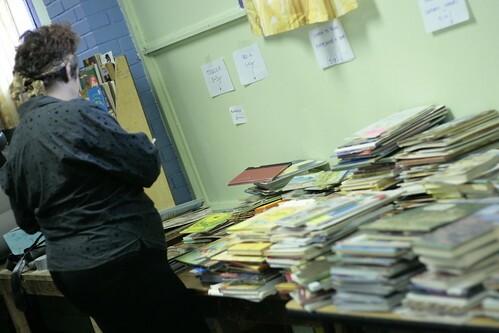 As I was interviewing children and meeting other community members, volunteer librarians were unpacking crates and boxes of books for sorting. They were cataloging the books into a database, and they were putting together shelves so they could begin making the space look like a library. While I took pictures, several of the children would run in from the playground and look around quickly before running outside gleefully. One kid even told me as he ran past, "I'm gonna read every book in here!" In so many ways, these kids are fighting the stereotypes that could easily be assigned to them. They're often first-generation Americans, their parents are often struggling financially and they attend a fairly segregated school, but their smiles and their optimism and their energy makes it hard to see them as stereotypes. They're kids. Kids who like to talk about themselves. Kids who like to read. Kids who are proud of their mothers and fathers for fighting for them. And they're becoming political activists. These kids are fighters. They're impressive. Being around them is humbling and energizing. The needs of the parents are changing daily, but if you'd like to get involved you can do so by bringing non-perishable food, drinks, cleaning supplies, books, and bookcases. 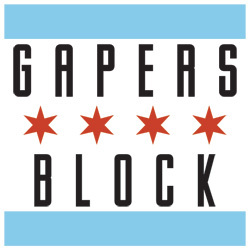 More information is available on the Whittier parents' website, and you can find more information about what the Chicago Underground Library needs to help build a library from scratch. Where is Davis Guggenheim? Here we have a story about a community taking on an entrenched bureaucracy to get their children what they need-a library. Meanwhile, the Union has been supporting the families while "reformer" Ron Huberman sends CPS goons in SUVs to patrol the area and threaten families. Perhaps this part of the "truth" is inconvenient. This story makes me really sad and not particularly hopeful. 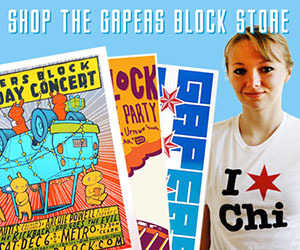 Parents in Chicago, both middle-class and poor, are really up against it. You want a playground in your area? Come up with $300K, minimum. That's a lot of bake sales. Want an expansion for your school? Lobby for a decade, or occupy. I'd love to think most of this is due to TIF plundering, but it's nearly Sisyphean. We can end this illegal sit in by calling ICE or INS to do a raid. You could certainly do that, Darryl. But that wouldn't end the sit-in because even if some of the parents are undocumented, the children aren't and they're participating in the sit-in as well. And I'd like to remind you that the first women who voted were arrested, as were the first black people who voted, as were . . . I suspect that if we knew the full story of where the funds for the school repairs and library funding went, there would be people to arrest, and they wouldn't be the parents trying to get a library. So which law-breaking is more important? Thank you for this, Cinnamon.